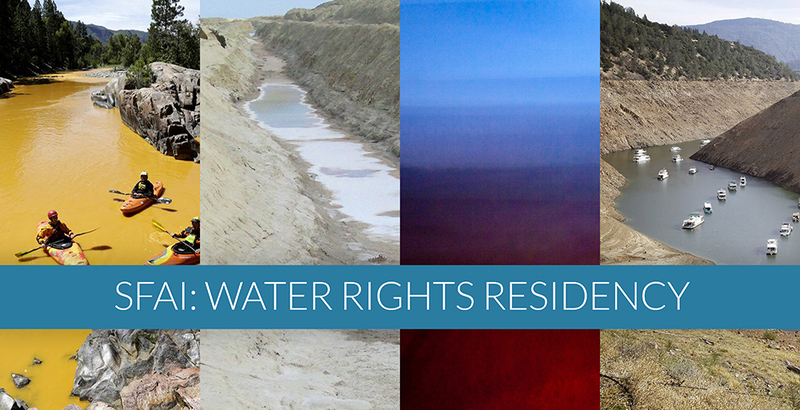 I’ve been awarded a residency at the Santa Fe Art Institute with a group of artists, film makers, & environmental activists, Kate Brown, Peter Bill, & Allyson Siwik as the GILA COLLECTIVE to explore the 2017 theme of “Water Rights”. With the support and organization of the Gila Conservation Coalition we have been preparing several elements to be grouped in an immersive gallery installation for the Gila River Festival in Silver City, NM on Sept. 21st – 24th, 2017. Working remotely in Washington State, New Mexico, and New York City for almost a year, we were finally able to meet in person for a camping trip on the Gila River. Planning, time lapsing, harvesting clay & plants for distillation, and just enjoying being on this wonderful river. 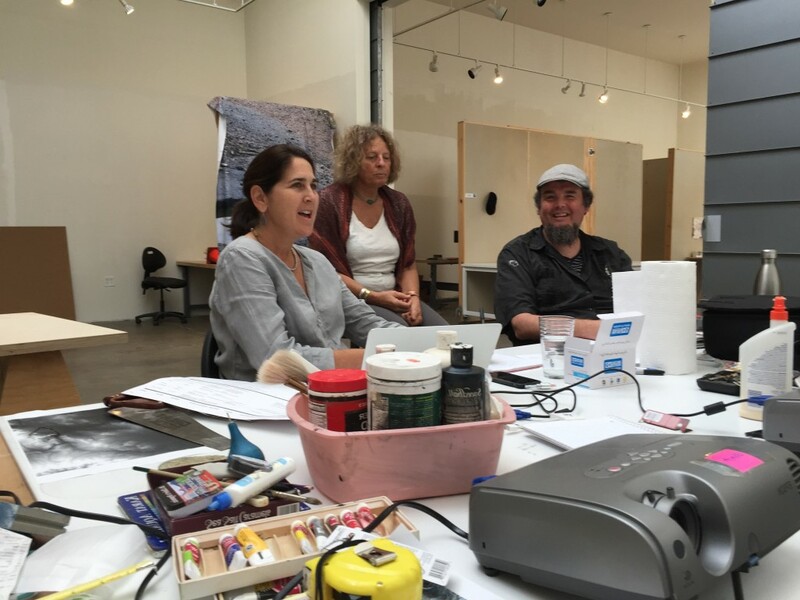 Our residency began at the Santa Fe Art Institute. 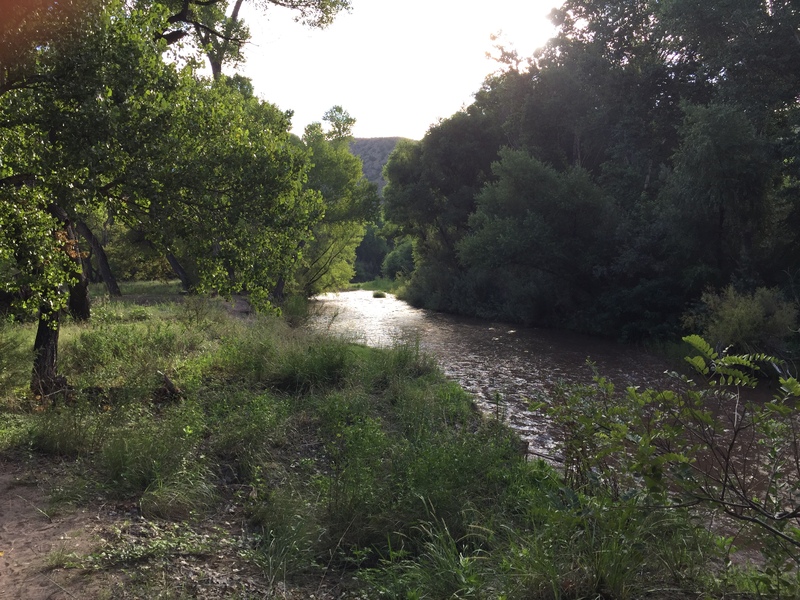 Focused on New Mexico’s Gila River, we explored ideas regarding the personification of the river, the river as an expression of memory, and presenting an overview of the history of the river. One of the elements we have been developing remotely is an olla or large clay vessel. When peering into the olla, the viewer will hear several people offer voice to the Gila River with their images projected on to mist. The mist in the clay pot also diffuses a Gila River fragrance that it composed of accords of River Water, Riverbed Clay, & Flora. Stephen wanted to create a complex and realistic olfactory portrayal of the Gila River that also used clay and plant life from the river itself to help transport viewers to that specific landscape. 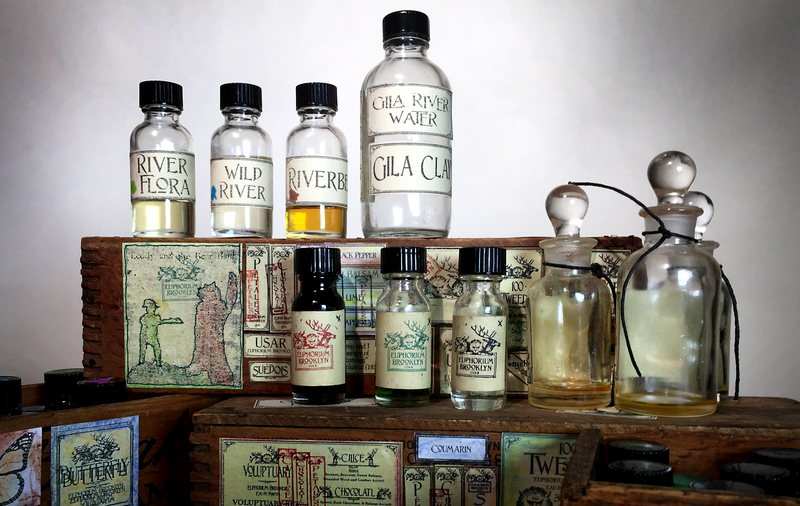 The installation fragrance was informed by his previous olfactory explorations of this river in the TABLEAU OLFACTIF- GILA CYCLE installation with Peter Bill in 2015. In this installation, attention was focused on the river specifically as opposed to the greater seasonal landscape. 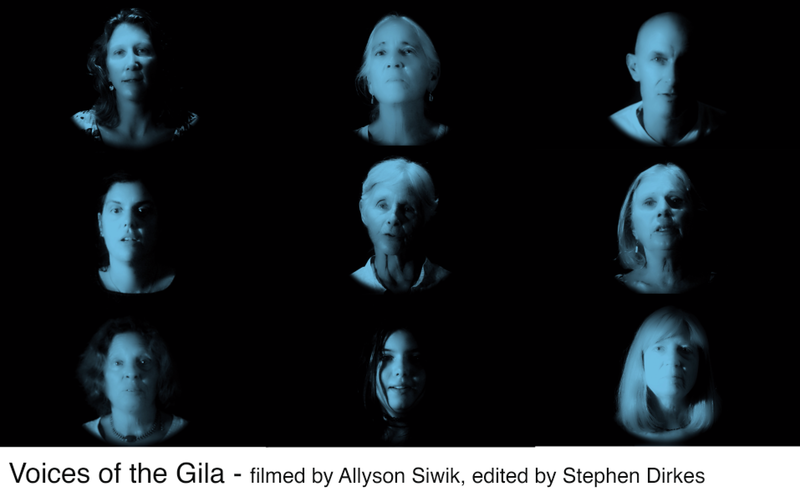 Allyson Siwik reached out to the Silver City, NM community to source input and contribution to the video content for the olla and turned her Gila River Coalition office into a temporary film set to capture a variety of voices to offer their input on “What would the river say?”. 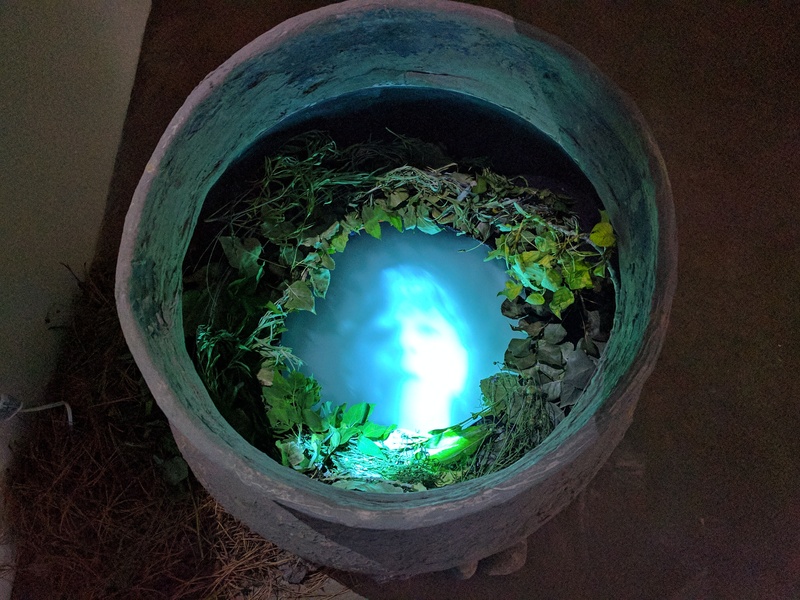 From Brooklyn, Stephen edited the footage and created a uniform look to be projected into a large clay pot. Fragrant Mist & Video Projection Tests from stephen dirkes on Vimeo. Stephen wanted to explore projecting video content on a mist surface as both an ethereal/ memory-like visual device and as a technique that directly employed water itself to see the video and began testing ultrasonic diffusers. Mist was also a means of diffusing the olfactory component which required a balance to diffuse the scent, but also contain it to remain localized to the vessel. 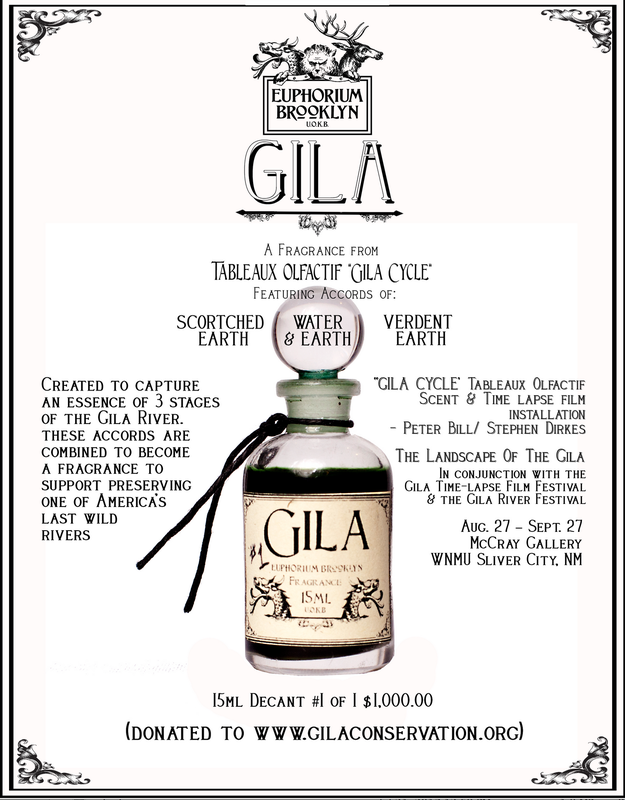 A variety of plants were harvested from the Gila River region and distilled to create the fragrance. Referencing a traditional Indian method of distilling clay from the river Ganges in the creation of the fragrant oil, Mitti Attar, Kate Brown harvested clay from the banks of the Gila to form small pellets she fired at a low temperature to remove excess water from the clay. Stephen distilled local creosote bush to add as a note to the fragrance accord as well. The scent of the desert when it begins to rain, is largely caused by a fragrance released by the creosote bush. Distillations for RIVER VOICE TIME Olfactory Installation from stephen dirkes on Vimeo. Visitors could experience the olfactory journey from the scent of harvested plants, to the hydrosols & essential oils that were distilled, composite fragrance accords, and ultimately the final RIVER fragrance. 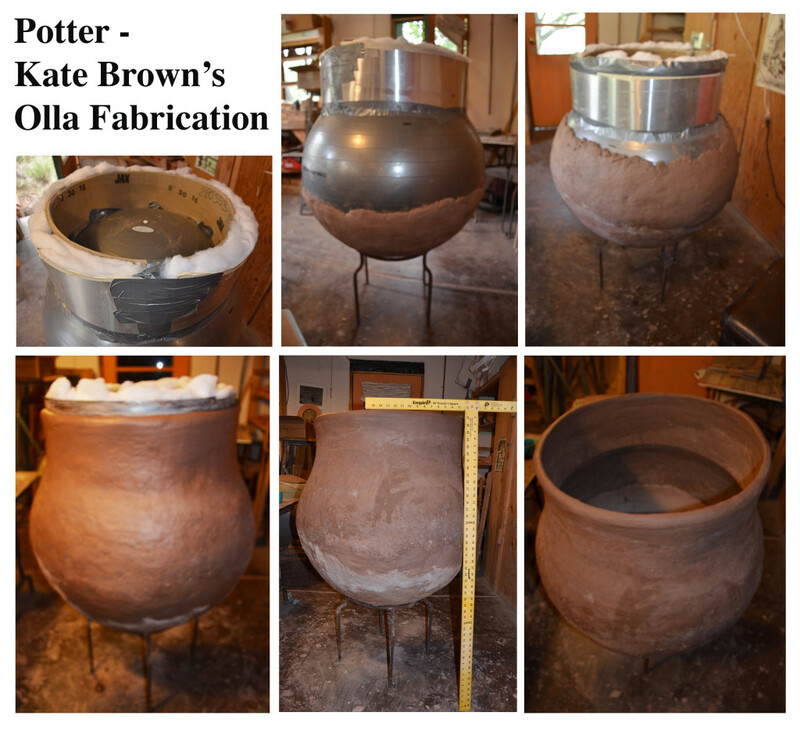 In her New Mexico studios, Kate Brown created a custom sculpting material utilizing Gila River clay in combination with other materials to fabricate the scale of olla/ vessel the mist video projection required and also be mindful of weight and structural integrity. Large Paper Crete Jar Fabrication from stephen dirkes on Vimeo. Kate refined the design and came up with a beautiful solution that breaks down into two parts for transport. The olla is only one of several objects in the full installation. 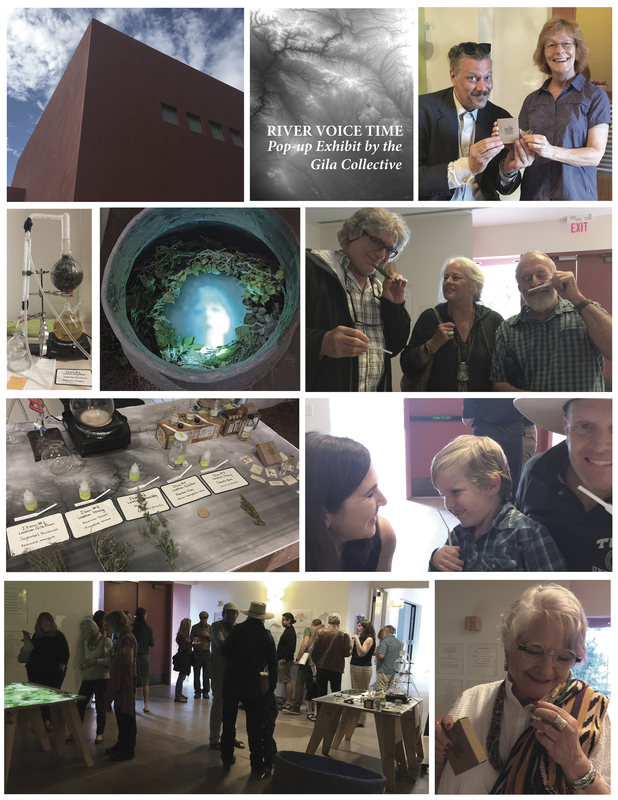 We are expanding, revising, & adding to the exhibition to create unique experiences for each of the shows we have arranged for RIVER VOICE TIME in Santa Fe, Silver City, & Albuquerque, New Mexico in 2017. Creating 3D Wooden Topographic Map from stephen dirkes on Vimeo. Peter Bill has been working to interpret topographic maps as cnc cutter information to create a 3D wooden map of the Gila River region that functions as a tabletop surface for projection mapped video content. Jeff Boyd created our master topographic map in Silver City, NM which 3D data was generated from. Peter Bill was offered training and time with a large format CNC machine by the good people at Make Santa Fe. Allyson Siwik developed a timeline of social development of the Gila River region from pre-history to present. The timeline took the form of an 8 minute looping video which is projected on the wooden map. Text, time lapse film, and animation were all be employed to visualize the narrative. Creating Painted Animation Sequences for Gila Collective's RIVER VOICE TIME Installation from stephen dirkes on Vimeo. 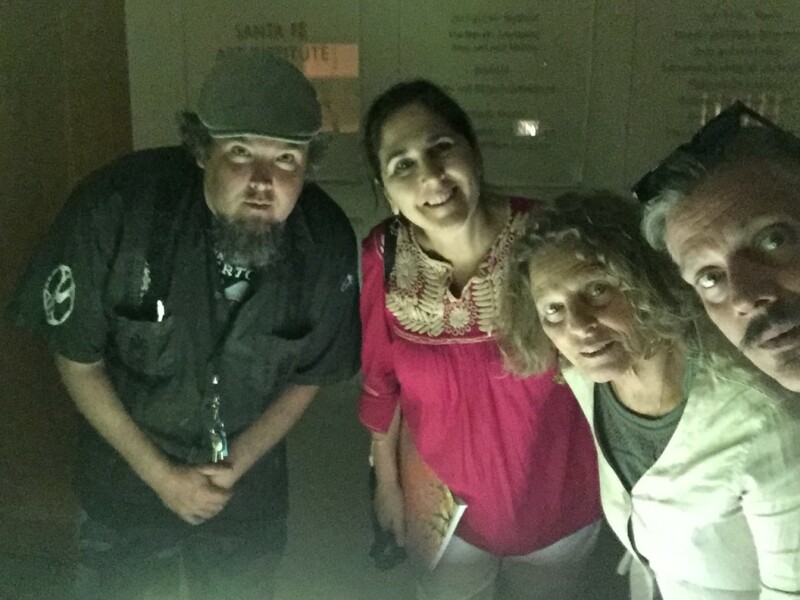 Our residency at SFAI concluded with a preview exhibition followed by a night to showcase the project to Meow Wolf guests at the Art Institute. Santa Fe Art Institute RIVER VOICE TIME Exhibition Preview from stephen dirkes on Vimeo. 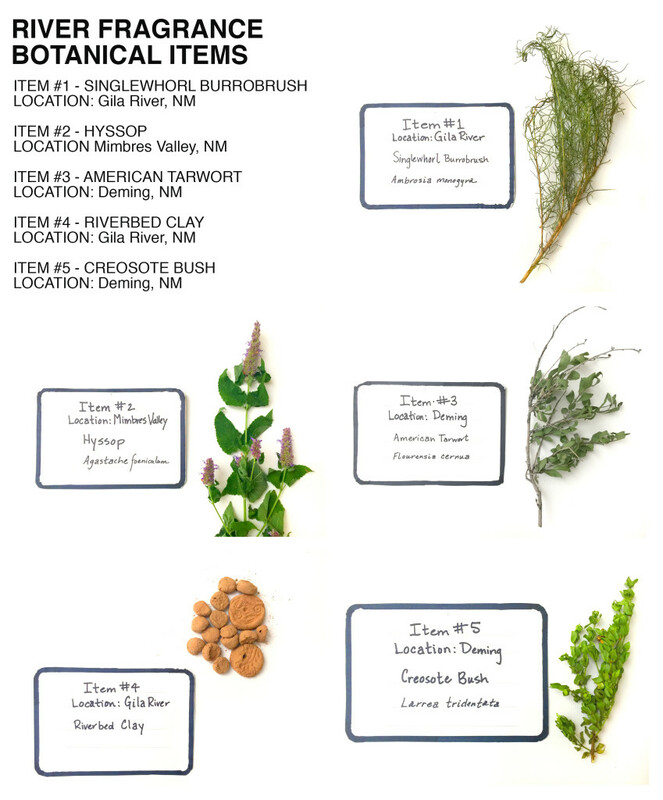 Visitors could request bespoke blends of the accords to make custom a RIVER fragrance for a charitable donation to the Gila Conservation Coalition. 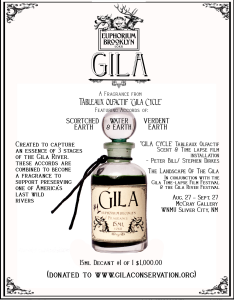 We will have a RIVER SET at the exhibition with an 8ML decant of RIVER Eau de Parfum, a hand made medallion of Gila river clay by Kate BroWn, & a small booklet explaining the project. River Fragrance from stephen dirkes on Vimeo. 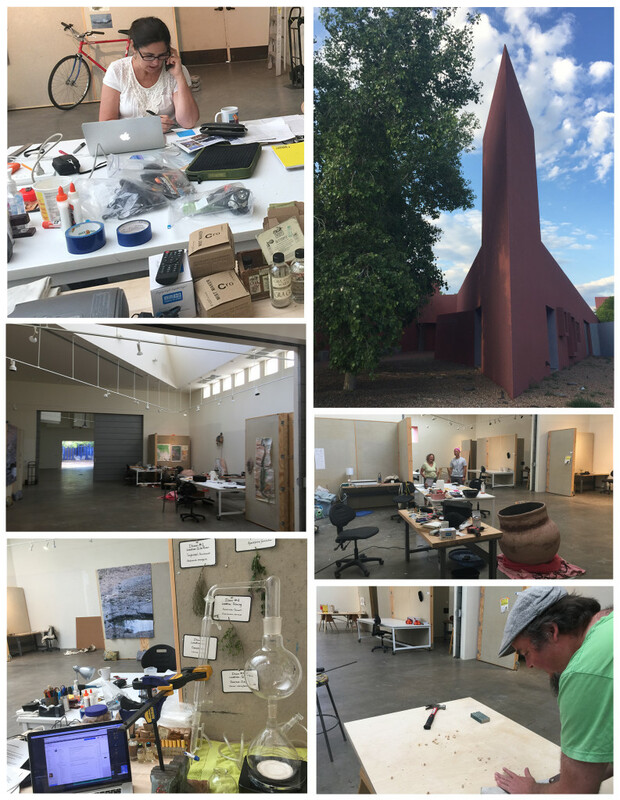 Our time at Santa Fe Art institute made the project possible and we were also able to learn about new work and make new friends with our fellow residents. Loved soaking up the Santa Fe scene in Meow Wolf, museums, mountains, botanical garden, & yummy food spots! Back to Silver City to install RIVER VOICE TIME and have an interview on 89.1FM for Earth Matters with Allyson Siwik and her interview of Toni Gentilli from Santa Fe Art Institute.